On December 11, 2014, the US House passed a bill repealing the Dodd-Frank requirement that risky derivatives be pushed into big-bank subsidiaries, leaving our deposits and pensions exposed to massive derivatives losses. The bill was vigorously challenged by Senator Elizabeth Warren; but the tide turned when Jamie Dimon, CEO of JPMorganChase, stepped into the ring. Perhaps what prompted his intervention was the unanticipated $40 drop in the price of oil. As financial blogger Michael Snyder points out, that drop could trigger a derivatives payout that could bankrupt the biggest banks. And if the G20’s new “bail-in” rules are formalized, depositors and pensioners could be on the hook. The new bail-in rules were discussed in my last post. 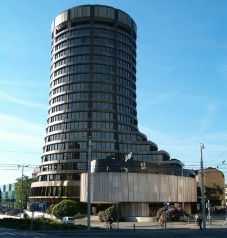 They are edicts of the Financial Stability Board (FSB), an unelected body of central bankers and finance ministers headquartered in the Bank for International Settlements in Basel, Switzerland. Where did the FSB get these sweeping powers, and is its mandate legally enforceable? This entry was posted in Bail In, Banks, Conflict, Deceptions, Education, Financial Repression, Financial Stability Board (FSB), Not so fast!, Uncategorized by Adrian Rowles. Bookmark the permalink.